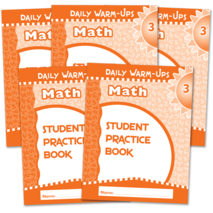 Each book in the Daily Warm-Ups: Math series provides students with quick, easy, effective activities that will help students improve their math skills. The content is correlated to the Common Core State Standards.Each book is divided into five sections: Numbers and Numeration, Operations, Measurement and Geometry, Graphs, Data and Probability, Algebra, Patterns and Functions. Adding one daily warm-up a day to the classroom schedule or at home gives students the practice they need to improve their math skills.